Located in the southern city of Muğla, Göcek offers a tranquil getaway. There are places that give you a different taste in every season and the same thing applies for Göcek, the "pearl" of Fethiye Gulf in Muğla. Göcek is a perfect place to visit as we start to leave the cold weather of winter behind and the sun has begun to put a little more shine on us. It is quite easy to access Göcek. After landing in Dalaman Airport after a 50-minute flight from Istanbul, it's just a 20-minute drive to the town center. As soon as you set foot in Göcek, the birds sing, the sea smells beautiful and white boats are at the marina to welcome you. Göcek is the best place to get body and soul ready for summer. Göcek is a small coastal town: Its population is not more than 5,000, but it is the apple of the eye for those in search of a quiet place to relax and have a pleasant vacation away from the crowds in popular holiday destinations. In the last couple of years, people, especially from Istanbul and Ankara, have started to take getaway trips to this lovely little town. To get to know this town before holidaymakers flock to it, April is the perfect month to visit. Göcek is still unspoiled, and since the houses are no taller than two stories, it looks different from what we are used to seeing in big cities. In Göcek, enjoy the harmony of blue and the green, eat the freshest, most-varied seafood imaginable and find yourself recharged and refreshed. Touring the small islands surrounding Göcek is always a good idea. 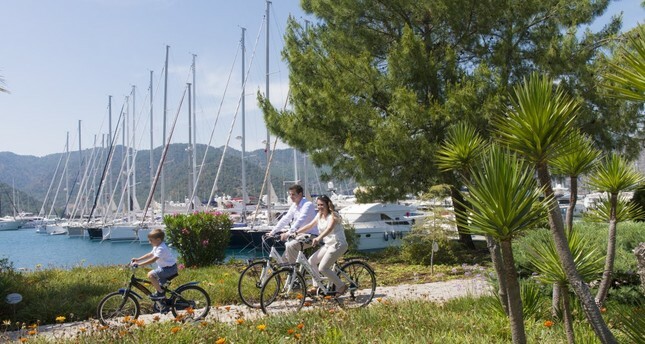 Hop onto the boats parked at the marina and enjoy the Göcek at its best. To be alone with family and friends, rent a private boat and ask the captain to take you to the islands. You can also enjoy the beaches in this small town. The nearest beach is 6 kilometers away at the İnlice Public Beach. If you don't mind a little distance, you can also visit Günlüklü and Katrancı beaches. Göcek is a very small town so do not expect crowded beaches on the coast. There is only one small beach in the center and that's all! Göcek Bay is full of marinas, and the town is home to international yacht races. The real Göcek experience lies in the little bays of Göcek, including Hamam, Göbün, Kille Bükü, Bedri Rahmi, Yavansu, Sarsala, Yassıcılar and Mart. There are two ways to access these bays: Either join a day-long tour or charter boat tours that take you to the blue Göcek bays for a week.